ILAC launched its Syria Rule of Law Assessment Report in New York at an event hosted by Sweden’s Permanent Mission to the United Nations. 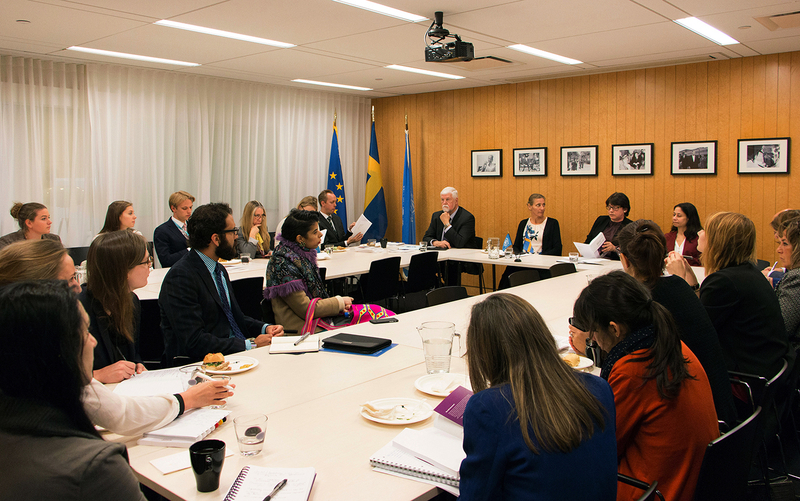 The Swedish Deputy Permanent Representative, Ambassador Irina Schoulgin Nyoni, moderated the April 19 event. ILAC’s new report explains how justice is administered throughout Syria after six years of conflict and provides a baseline for future reconciliation efforts with a comprehensive, publicly available account of the current state of the Syrian justice sector. Stockholm, Sweden — The International Legal Assistance Consortium (ILAC) today released a new report that explains how justice is administered throughout Syria after six years of conflict. ILAC’s Rule of Law Assessment Report, Syria 2017 provides a baseline for future reconciliation efforts with a comprehensive, publicly available account of the current state of the Syrian justice sector. In November and December 2016, ILAC’s nine-person assessment team met with over 100 Syrian legal professionals, civil society actors and international officials. Among those interviewed were approximately 70 Syrian judges and lawyers, who included both those currently practicing law in different parts of Syria, and those who have been forced to flee to neighboring countries due to the conflict.